What Is the PALM Network? 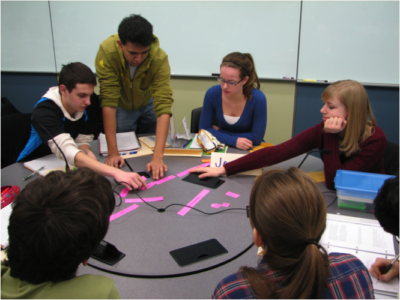 The Promoting Active Learning and Mentoring (PALM) Network was established to increase the use of active learning in undergraduate lecture courses. PALM guides instructors to put into practice effective methods of active learning under the sustained mentorship of other instructors with experience in evidence-based active learning. Each Fellow works individually with a mentor chosen to help the Fellow reach specific goals and objectives, but there are also shared resources, conference calls, and Network gatherings with workshops in which Fellows and mentors can learn from each other. This network of Fellows and their mentors are recruited and supported in their professional development by a network of life science professional societies. Fellows and mentors also disseminate information about their mentorship experiences and products through their professional society meetings, websites, and social media. Who Can Be a PALM Fellow? PALM Fellows can be postdocs aiming for a career that involves undergraduate teaching or they may be faculty at almost any stage of their academic career. They can be from any kind of post-secondary institution. PALM particularly welcomes participation from instructors at two-year institutions and minority-serving institutions. You do not have to be a member of ASCB to apply. Why Become a PALM Fellow? 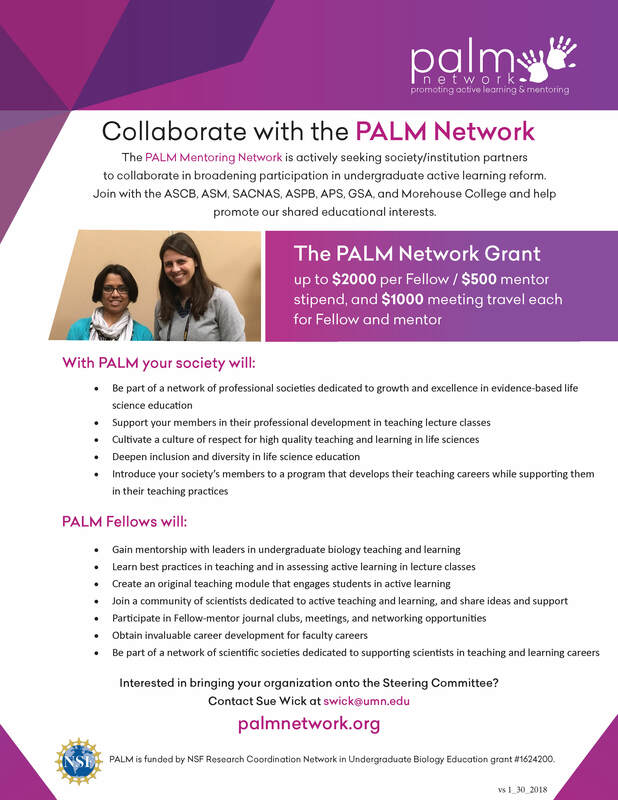 PALM Fellows and mentors must belong to either a disciplinary-based professional society, a professional society that promotes the advancement of a group underrepresented in STEM (such as SACNAS) or an education-focused professional society like SABER or NABT. However, if you are a community college instructor you may apply without joining a professional society, although many societies have discounted rates for instructors at community colleges. Applicants must demonstrate an abiding/sustainable interest in undergraduate biology education. Applicants must establish a mentor relationship before formally applying. Mentors must be skilled in active learning strategies and evidence-based teaching that align with Vision and Change See http://www.visionandchange.org. Mentors must belong to (or join) one of the PALM Network organizations. Applicants without immediate access to their own teaching setting may be considered. PALM will fund up to $2,000 for Fellows to visit, observe, and work with a mentor. Funds will be in the form of reimbursements for submitted receipts for pre-approved expenses, which include site visit travel and teaching materials. Funds may not be used for indirect or overhead costs, salaries or wages, classroom technology or lab equipment or supplies, or alcoholic beverages. Reimbursement (as opposed to lump-sum payment) relieves the recipient of any tax implications. Reimbursable receipts must be submitted within 9 months of receiving the award notification. Fellows and mentors will each receive up to $1,000 (reimbursed travel receipts) to present their work and its outcomes at a meeting of a professional society or a national group focused on teaching and learning. Reimbursable receipts must be submitted within 30 days of travel. Mentors must belong to either a disciplinary-based professional society, a professional society that promotes the advancement of a group underrepresented in STEM (such as SACNAS) or an education-focused professional society like SABER or NABT. The mentor works with the applicant to plan the project and its implementation, either in the Fellow’s classroom, or in the case of postdoc who is not currently teaching, in the mentor’s classroom. The mentor works with the applicant to devise a timeline and format of their mentoring interactions, including the Fellow’s visit(s) to the mentor’s institution. The mentor supplies a letter of support that promises to mentor the Fellow throughout the duration of the proposed activities, and that addresses the mentor’s experience in using the active learning approaches the Fellow has proposed to learn. The $2,000 award is for travel costs to visit your mentor and not lab supplies, textbooks, technology, etc. Instructional strategies you would like to explore, if known, etc. The following documents show an example of a successful PALM application as well as the feedback given, which generated through use of the rubric. How/where did you hear about the PALM Network? In order to create a single PDF of your application, please copy the text from the following documents and paste in the appropriate text boxes. Who should receive an acknowledgment letter (e.g., dean name and address)? If you are not redirected to a confirmation page upon submission, please email your info to swick@umn.edu. The PALM Network combines the shared educational interests of scientific organizations working for Vision and Change. The Steering Committee oversees the program, screens applicants for mentorships, provides mentor orientation and regular follow-ups, leads an information sharing meeting of all Fellows and Mentors each summer, and advises how to expand the network to reach more instructors of underrepresented students. Establish application review committees with members of Network societies as needed per the application cycle and application pressure. Screen applicants with an evaluation rubric to assess the likelihood of success for the identified work. The rubric assesses: mentor selection; learning outcome goals; plans for implementation, assessment, dissemination; and budget. Assess the effectiveness of each awarded active learning mentorship intervention by using the Classroom Observation Protocol for Undergraduate STEM (COPUS) to analyze videos of PALM fellows’ teaching before and after mentorship. Host a yearly gathering of fellows and mentors to provide a supportive community to encourage further development and to solicit suggestions to improve the program. Expand the reach of this program through dissemination activities including societal meetings, media streams, and publication outlets. Seek to expand the network to reach more instructors of underrepresented and economically disadvantaged students. Rely on sustained input from a Steering Committee that includes collaborative education leadership from PALM Network professional societies as well as individuals from a diverse array of undergraduate institutions. Questions? Please email Sue Wick at swick@umn.edu.